Going to a Spanish speaking country and want to learn to converse with the locals before you leave? Want to continue or refresh the Spanish that you have already learned? 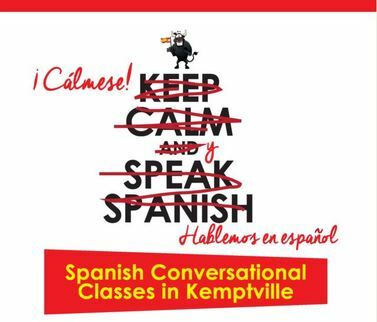 Conversational Spanish beginner and intermediate classes are now available in Kemptville and Brockville and are offered 3 times per year - February, April and October. The next Beginner classes will be Thursdays starting February 21, 2019 (Kemptville/Brockville). Intermediate classes run each Wednesday starting February 20, 2019 (Kemptville only). Sessions run from 6:30pm to 8:30pm and are 8 weeks in length. Cost is just $195 person, plus books (approx. $95). Classes are held at St Michael's High School, Room 186, 2755 County Road 43, Kemptville, ON or, Bridlewood Manor (Revera), 1026 Bridlewood Drive, Brockville (lower level). To register for HolaNG classes click here! Ruben Hernández is the Spanish teacher for beginner and intermediate conversational Spanish in Kemptville at St. Michael's High School. He was born and raised in Lima, situated on the Pacific coast of Peru, South America. In 1989, he moved to Mississauga, Ontario, where he finished Secondary School at Father Michael Goetz. After high school, he chose to study at the University of Ottawa, because of its bilingual character. Ruben graduated from the University of Ottawa with a Bachelors’ Degree in Arts, with a specialization in Spanish. Two years later, he earned a Masters’ Degree in Spanish. Ruben always enjoyed helping students. Prior to teaching Spanish at the University of Ottawa, he tutored students in Spanish and Mathematics. He also volunteered assisting students in the Help Centre at Carleton University. He assisted Professor Angelo Mingarelli at Carleton University, in writing the solution manual for the mathematics textbook: “The ABC's of Calculus,” published in 1999. In his free time, Ruben enjoys playing soccer, swimming, reading, chess or watching movies. He lives in Ottawa with his wife and two children. He truly believes in the Chinese proverb from Confucius, regarding teaching, “Tell me, and I will forget. Show me, and I may remember. Involve me, and I will understand." Rubens’ philosophy in life, is that all people can learn a new language and succeed. Ruben has been teaching beginner and intermediate Spanish, in the community of Kemptville, for the past 2 years. **Once classes begin, should a student need to cancel their participation, a refund toward a future course will be accommodated (if the student has participated in less than 3 classes).